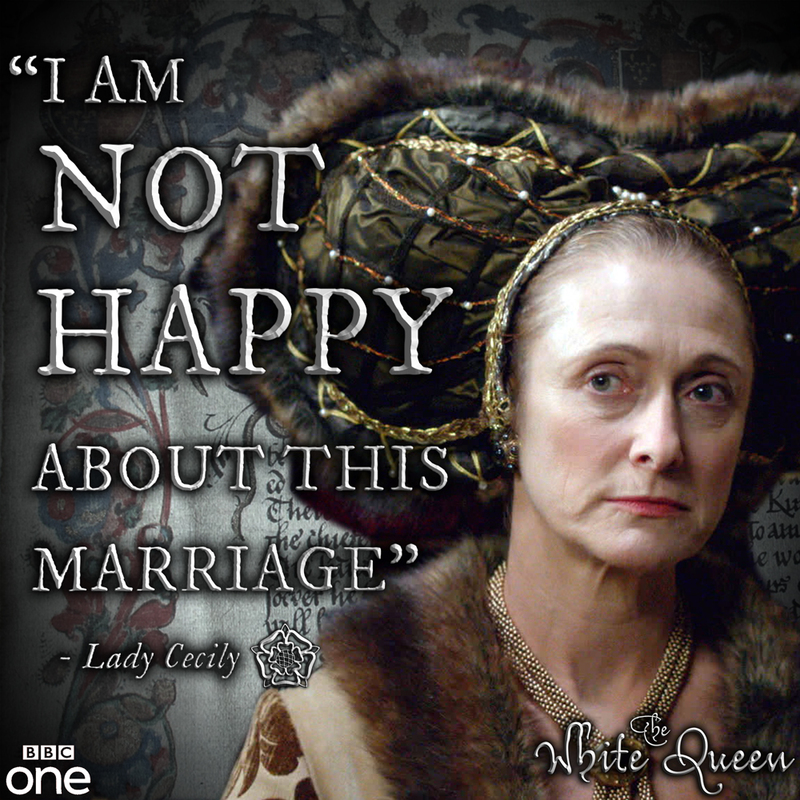 The Duchess is accosted by Lady Rivers about her supposed affair in ‘The White Queen’. Edward IV was born on April 28th, 1442 in Rouen, France. He was the eldest surviving son of Lord Richard, Duke of York and Lady Cecily (Neville), later known as “Queen by Right”. Edward became the first York monarch after his father was killed in battle. His father had planned on being crowned as soon as possible, but his untimely death left his son and heir the new King of England. Edward was King from 1460 to 1470 then again in 1471 until his death in 1483. Edward was cousin to queen Katherine Parr’s paternal great-grandmother, Lady Alice FitzHugh (born Neville). The relationship between Katherine Parr’s paternal grandfather, Lord Parr of Kendal, and Edward IV has been well documented as the two were close due to his marriage to Edward’s cousin, Elizabeth FitzHugh. The FitzHugh’s were closely affiliated with the Earl of Salisbury (Katherine Parr’s great-great-grandfather) and the Earl of Warwick (Parr’s great-granduncle). The FitzHugh and the Earl of Warwick’s properties were in close proximity so Elizabeth grew up next to her cousins Ladies Isabel (later Duchess of Clarence) and Anne (later queen). The ‘White Queen‘ (BBC) popularized the myth that Edward IV was the son of a Welsh archer called Blaybourne; a result of an affair Blaybourne had with Edward’s mother Cecily while she and the Duke of York were in Rouen. Several historians have given credence to this myth arguing that Cecily conceived while her husband was away fighting at Pontoise. While the fact that York fought in Pontoise in August is true – it is in no way proof that Edward was the product of an illicit union. What none of these historians and novelists factored in however, is the time between conception and giving birth. Nowadays with modern science it is easier to predict when one conceives and one gives birth, but it is not an exact science yet. There will be mistakes. There will be factors that determine whether a pregnancy comes to term or not, whether the baby arrives at the exact date the doctor or midwife foresees is 50/50. Now imagine yourself in the first half of the fifteenth century with no modern medicine and only midwives and religious superstition to tell you whether you were pregnant or not, if the child you expected was a boy or girl, or if you were closer to term according to the fullness of your belly. Doesn’t sound like it would give us much accuracy, does it? This is the world that medieval women lived in. They had to rely on the science of the day which was religion and they had no other experts to go on to give them advice except for midwives and they had to believe in (outrageous to us now) methods of conception such as potions made of different ingredients like rabbit’s blood, sheep urine, mare’s milk, quale’s testicles, etc. Edward was Cecily’s third pregnancy. She and the Duke were married by October 1429 (some put their marriage two years before when she had reached the age of majority that was required of girls to marry at twelve); he would have been eighteen and she fourteen. They didn’t have their first child until 1439, more than eight years after their marriage. If Cecily and Richard were eager to conceive why wait so long? Like with most arranged marriages, there was bound to be some shyness. Richard and Cecily were by no means strangers to each other. Before Cecily’s father died, he passed on Richard’s custody to his wife Lady Joan Beaufort, Countess of Westmorland (only daughter of John of Gaunt, Duke of Lancaster and Katherine Swynford Roet). Cecily was the youngest of Lady Joan’s children and being so close in age, Cecily and Richard grew up under the same roof and it is highly likely that when Lady Joan took Richard to London, she brought along her daughter. But being so young, they could have been hesitant to consummate the marriage and waited until they knew each other better. There is no indicator that the couple was unhappy, it soon became known that Cecily was an excellent mistress of the Duke’s household and tried in every way to imitate the royal court by ordering expensive fabrics and arranging for extravagant banquets, especially after he became Lord Lieutenant in Normandy and moved to Rouen. The reason as to why the couple might not have had children is because before moving to Normandy, Richard was often away. This was the reality many wives had to face. Husbands were often gone for long periods of time due to war or business. Another possibility could be that because during this period miscarriages and births were not often recorded, she could have been pregnant but suffered several other miscarriages that we simply do not know about. Either way, the fact remains that when Edward was born there was not a lot of fanfare for his christening. This could have been due to him being conceived after Richard, Duke of York returned from Pontoise which would make Edward premature and make his parents alarmed since this was an age where infant mortality was very high. Newborns that were too small or too weak were christened immediately to save them from the eternal damnation of limbo. This makes even more sense when we take into account that the year before Cecily had given birth to a boy who lived less than a week. It was vital at the time for the two to have a male heir to continue the York line. During his lifetime, Richard, Duke of York never showed any indication that he suspected Edward was not his. In fact during their last years at Rouen before they were recalled to England, he was negotiating a marriage between his son and the King of France (Charles) daughter, Marie, who was born in 1444. Had Edward not been his son, he would not have shown this much favor or invested so much in his education and military training. As for the silly rumors of his appearance that he was fair while his father and brother (Richard III) were dark, we must remember that Edward III (from where both his parents descended) was fair and tall so he could have gotten his looks either from their ancestor or his mother. The theories that still surround his parentage are nothing but wild rumors and conjectures based on propaganda and history is filled with this. History is made by the winner but I would also add, by conspiracy and fantasy and very often these get mixed up with the truth that in the end we lose track of what is fact and what is fantasy. The fact of the matter is, the name Blaybourne did not come up until 1460 which was the year let us all remember that England was in open war with itself, two rivaling Houses –Lancaster and York- competing for the English throne. York had used years before the same device against the Lancastrian Queen, Marguerite of Anjou to strengthen his own claim, now it was only fair that her side shot back by saying the same thing about his wife. It was a way to discredit Richard and discredit his son who was the Earl of March at this time. That was what was often done to opponents of the king when they wanted to take his crown, they spread rumors surrounding their rival’s parentage or their families, and the targets would always be women. Cecily Neville is known today by many names –“proud Cis” “Queen by Rights” “Rose of Raby” –etc. She’s been portrayed countless of times in fiction, sometimes negatively, sometimes positively, but all of these portrayals miss the real woman behind the myth. The real truth about Cecily lies buried in the pages of her religious books, in her sons, her actions, her words and her religion which she always held dear. As a noble woman, she held to the standards of the time by giving opulent parties and indulging in the fashions of the time, she was known to be one of the best dressed women in England, as a woman she was a mother and peacemaker, she always tried to bring her sons together when she sensed there was trouble. And as a Duchess, she was her husband’s equal. Richard relied on her for everything. Whenever he returned he always asked for her to accompany him, after his short-lived triumph in 1460, he sent for his wife to London to join him in his triumphant moment when he attempted to take the throne. After he had been recognized as the King’s legal heir years back, Cecily began using the moniker “Queen by Rights”; after he died she became her son’s advisor and the first woman in the fifteenth century to use the title “my lady the King’s mother”, and until her son married in 1464, she was the top woman in England. After years of fighting however, Cecily retired and chose to lead an ascetic life. Like her mother, she was very religious and aware of her lineage. While there were cases of spousal infidelity, a woman like Cecily was unlikely to risk everything she had for an affair. Lady Cecily, Duchess of York portrayed by Caroline Goodall. Scene RE-DONE the way it should have been done! You bow twice to the King’s mother and she doesn’t back down! After the first episode of ‘The White Queen’, I was quite upset at the representation of the King’s mother, the Duchess of York [I even wrote a blog I was SO upset]. As a royal Duchess who would have become Queen if her husband had not died — she was in fact practically queen in all but name; Queen Mother. Her husband, Richard, Duke of York, was granted the title of Prince of Wales and Lord Protector so Cecily was technically Princess of Wales before her husband died. 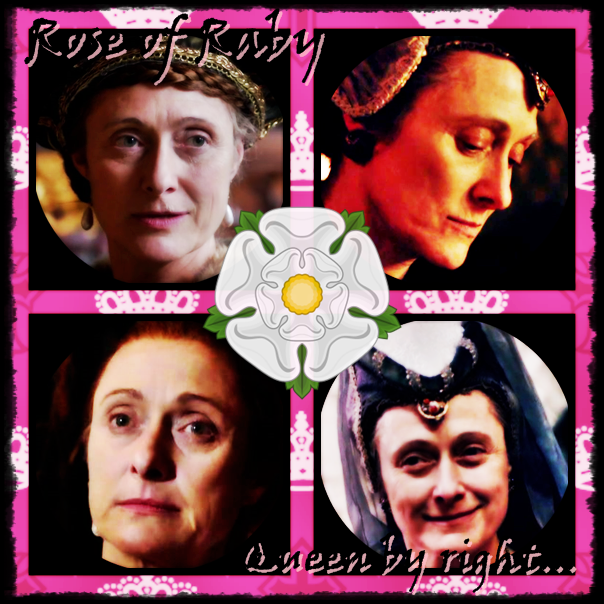 Born Lady Cecily Neville, she was part of the powerful Neville family which would help bring her son to the throne. Cecily was the youngest daughter of Sir Ralph Neville, 1st Earl of Westmorland and his second wife, Lady Joan Beaufort, herself the daughter of one of the most powerful royal Princes and noblemen in history, Prince John of Gaunt, Duke of Lancaster. As such, Lady Cecily was a niece of King Henry IV of England, cousin of King Henry V, and cousin, once removed of King Henry VI. And by the marriages the children of the Duke of Lancaster made, Cecily was kin to several royal houses on the continent, i.e, Portugal, Castile, and Burgundy. She was of royal blood being the great-granddaughter of King Edward III and his consort Philippa of Hainault. Her husband, the Duke of York, was the leading contender for the House of York’s claim to the throne of England. York was made Lord Protector of England in 1453 and 1455, however he did not press his claim to the throne during these two periods. In 1460, York was named Prince of Wales and again Lord Protector of the Realm. With King Henry VI in custody, the Duke of York became the de facto ruler of England. However, before York could claim his crown, he was defeated in December 1460 at the Battle of Wakefield with his son, Edmund of York, and his brother-in-law the Earl of Salisbury. The Duchess of York narrowly missed becoming queen of England and her eldest son, Edward, Earl of March, was crowned Edward IV of England in March of 1461. However, in 1477, following the marriage of her grandson Richard of York, the Duchess was accorded the title ‘Queen of right‘ after using the title of ‘Cecily, the king’s mother and late wife unto Richard in right king of England and of France and lord of Ireland’ since 1464. “Warwick rose toweringly. His rose-dappled mantle swirled; black hair curled on his brow. Everything of him was puissant and challenging and might have said: Behold us! We of the royal blood, of Edward the Third…” — ‘The King’s Grey Mare’ pg 53. [Warwick was Cecily’s powerful nephew who helped Edward to his throne]. The first episode as dictated by Gregory and her writer — was a travesty towards the Duchess. “You can lower you eyes all you want — I shall laugh and thank you for your visit…I AM the King’s mother and Duchess of York; queen of right!” — Lady Cecily, Duchess of York. Alison J Spedding. ‘At the King’s Pleasure’: The Testament of Cecily Neville, University of Birmingham. Midland History, Vol 35, No 2, 2010. pg 256-72. Joanna Laynesmith. ‘The Kings’ Mother,’ History today. 56, no. 3, (2006): 38. How important is authenticity when filming historical dramas? Terribly important! You should see the notes I sent to the series producers waxing lyrical about the use of horses, clothes, how people travelled, and so on. That sort of thing really matters. However, there are a number of compromises you do have to make when working in film, which can be very frustrating – that’s why I’m a novelist, I suppose. 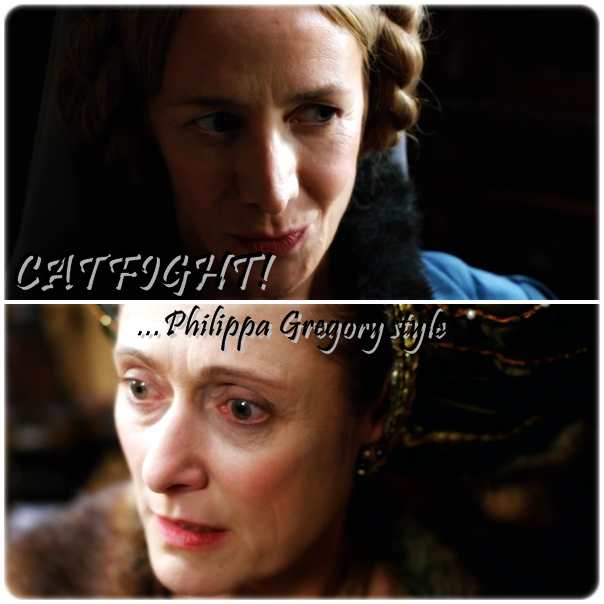 Elizabeth and her mother Lady Rivers meet the King’s mother in ‘The White Queen’, episode 1. Sunday nights episode of ‘The White Queen’ in my opinion was great. Put a woman screenwriter together with the BBC and bam! However there was something that really made me angry about the episode and surprise, surprise — I’M NOT THE ONLY ONE who had a problem with it. Amy Licence, author of the latest biography of Queen Anne Neville and Elizabeth of York reviewed the first episode. Licence and I agree on this both — she basically sums up that they (screenwriter or Gregory herself) REALLY screwed up on behalf of Lady Cecily Neville, Duchess of York (grandaunt of Anne Neville); thank you Lord! I’m going to be brutally honest here — are you kidding me?? I don’t like Jacquetta’s “holier than thou” attitude that is emerging. This was obviously a horrid and tasteless attempt to boost Jacquetta’s influence and “power” over the Duchess. It’s more than obvious that Gregory has become obsessed with Jacquetta and her daughter. In my opinion, if they REALLY wanted to boost Jacquetta SO much — they could have done it in a different way. They didn’t have to insult the King’s mother, the daughter of a powerful Earl and Countess Lady Joan Beaufort, granddaughter of a royal Duke of Lancaster and titular King of Castile [son of King Edward III of England], and widow of the Duke of York [double descendant of Edward III]! I know it didn’t happen in history, but still — that scene should have been cut or done differently. If they had been at court and the Duchess had been sitting with her son, I do not think the two would have addressed each other as such and Elizabeth wouldn’t have pulled the Queen card after letting her mother b***h out her mother-in-law. It’s rather ironic that Elizabeth comes in flabbergasted, but after her mother calls her mother-in-law a whore she has the nerve and guts to demand the Duchess bow down to her; then gloats to her husband how everyone is “great friend’s” now. Yeah, sure — Elizabeth is now best friends with “Duchess Cecily”. I don’t think Gregory thought about court etiquette when writing these books and whoever approved the scene has not read any history books lately. “James Frain, recently lauded for his performance as Thomas Cromwell in The Tudors, may well emerge to steal the show alongside Margaret Beaufort and the other York brothers…” Even Licence applauds Lady Margaret Beaufort early on.